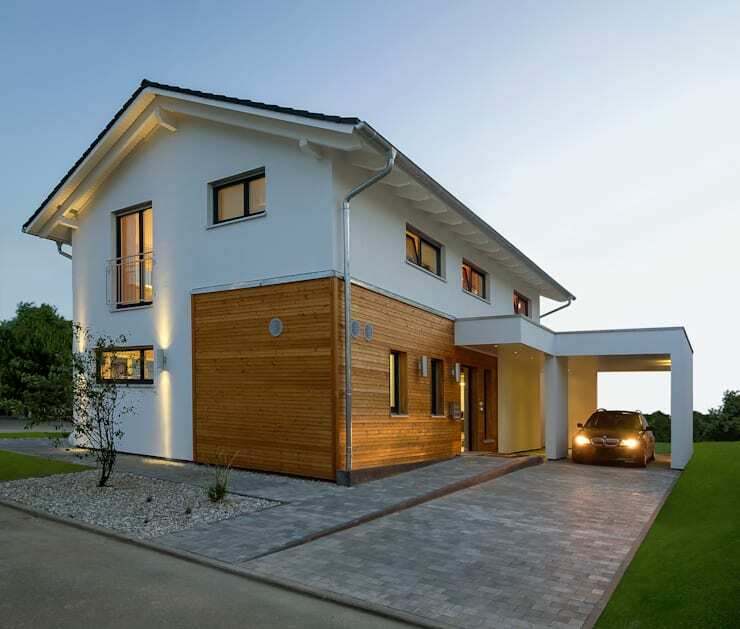 This stylish home, located in Germany, showcases an award-winning, sustainable construction courtesy of Licht-Design Skapetze GmbH. 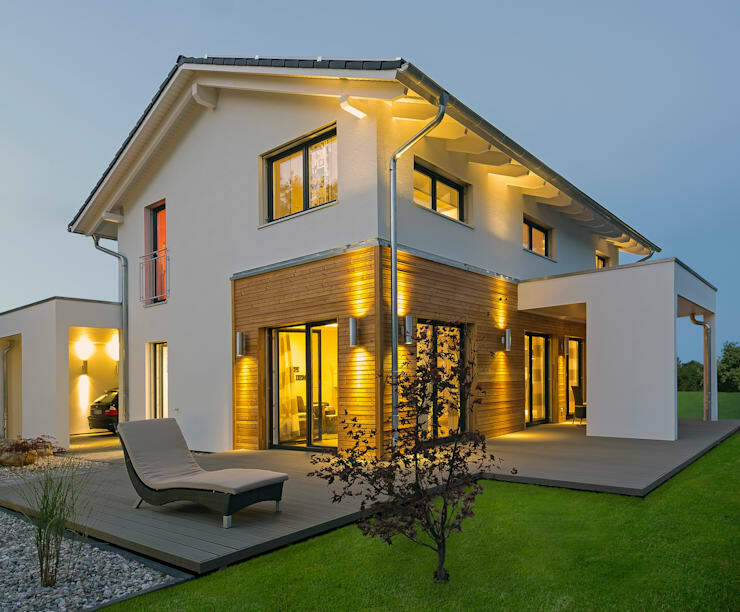 The winner of the Deutschen Traumhauspreis for 2015, this home has the amazing ability to produce more energy than is consumes, due primarily to its sophisticated photovoltaic solar system and energy efficient lighting fixtures and appliances. Indeed, the home presents the perfect marriage of form and function as, framing its credentials as an eco-conscious dwelling, is a stylish, modern construction filled with sunlight and playful decoration. The exterior presents a simple, white structure encasing myriad windows and glass doors, with panels of timber included to add contrast and character. A simple deck frames the house, providing an understated yet functional locale for outdoor living, while inside we're met with high walls and ceilings in pale tones, furnished with hints of colourful eclecticism. The kitchen and dining room within the home exude contemporary sophistication, as does the bathroom which has been styled in black and white. Upstairs, however, the home's bedrooms depart from the muted palette of the ground floor, with more colourful decor employed. This house is an absolute inspiration for those seeking to create a dwelling that combines sustainability with modern style. 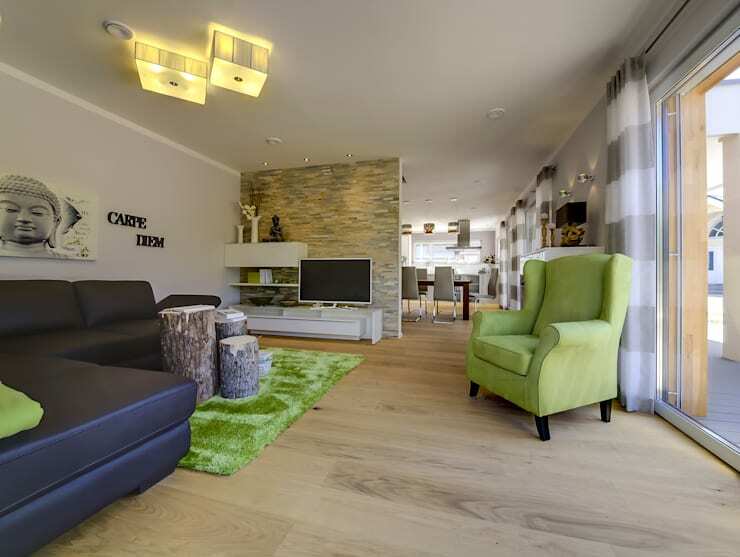 Take a tour below and see for yourself! The exterior of this lovely abode showcases a simple form with plenty of contrast to add a sense of character. Built over two floors, the construction appears sleek and modern, with the flowing lines of its white facade broken by sections of timber paneling. Surrounding the abode is a perfectly paved driveway and well-manicured lawn, with the scene as a whole exuding polished sophistication. As we traverse the exterior we find that this house also includes plenty of space for outdoor living. Framing the opposite corner is a large deck, constructed of grey timber slats, which rests in simple style, providing a space on which the occupants can enjoy warm weather. This vantage also displays the array of glass doors populating the home's lower level, which open the abode up to the elements, allowing light and air to refresh the interior. Moving inside and we're embraced by an open interior, dressed in the pale tones of light timber flooring beneath white walls and ceilings. Unique and eclectic furnishings enliven the understated decor, with splashes of colour seen here in the green armchair and rug, and an array of small logs placed by the chic, leather sofa to serve as makeshift coffee tables. The kitchen and dining room exude contemporary style and sophistication, with the kitchen space finished in white and stainless steel, and beautifully lit through an expanse of windows streaming above the cooking area. 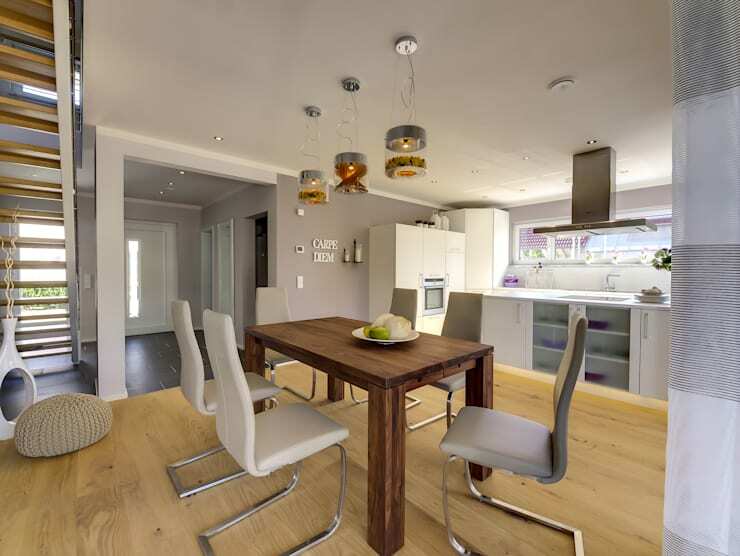 The dining setting appears simple and inviting, with its sturdy, timber table surrounded by an array of stylish, contemporary chairs, upholstered in pale leather. 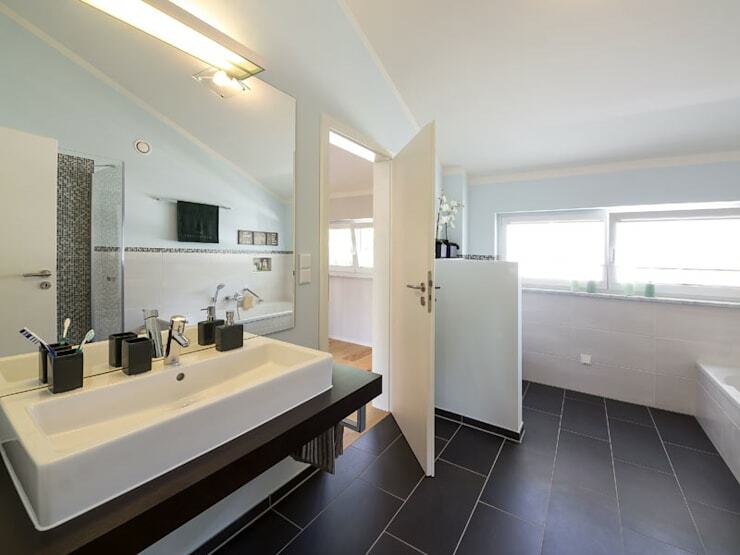 In the bathroom we find another open and inviting space, this time displaying the striking combination of black and white decor, with the room's dark floor tiles laying the foundation for a bold aesthetic. A large mirror provides a sense of visual expanse and also reveals the black and white mosaic tiles lining the shower unit. A generously sized sink and bath tub in pristine white add an air of luxury, with each gleaming beneath the sunlight flowing into this room through strategically placed, frosted windows. 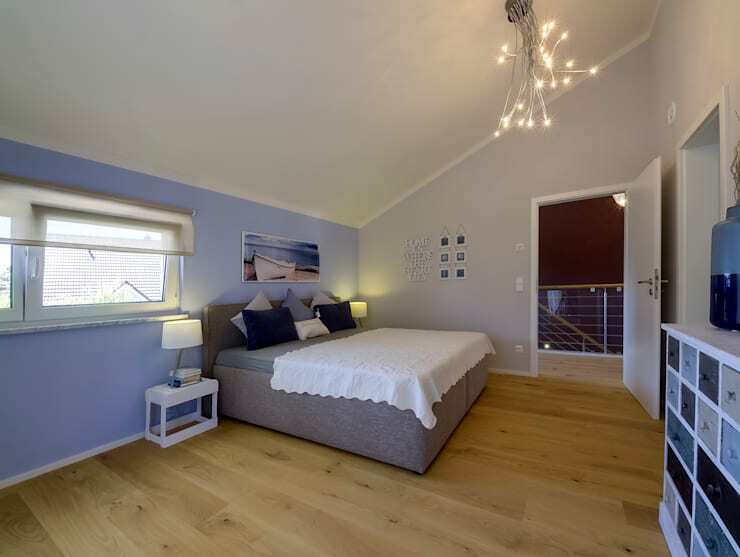 The master bedroom is spacious and lofty, with the ceiling streaming upwards in line with the apex of the home's roof. Decor of pale blue and grey has been employed for a cool, uplifting effect, while a king-sized bed in minimalist style invites relaxation from the corner of the room. Hanging overhead is a sculptural array of LED lights, which add a sense of artistic character to the space, while using a fraction of the electricity of conventional lighting systems. Also included in this lovely dwelling is this vibrantly coloured children's room, with its bright pink feature wall immediately engaging the eye. A palette of orange, pink and purple defines the furnishings, with the room exuding a playful and vivacious sense of style. As with all of the spaces in this home, the children's room benefits from a generous influx of natural light, which streams through its terrace door and windows, illuminating the bright decor and providing a lovely view of the home's surrounds. If you enjoyed the unique construction and sustainable design of this home, you should also take a look at these 6 steps to an eco-friendly home for more ideas and inspiration! Do you think self-powered homes will be the future of modern architecture? Tell us your thoughts below!